The largest gold nugget 'officially' reported as having been found in New Zealand weighed just over 99 ounces and was discovered on the West Coast near Ross in 1909. It was named the “Hon. Roddy”, after the then Minister of Mines, the Hon. Roderick McKenzie. Soon after being found the “Hon. Roddy” was bought by the New Zealand Government for £420 and then given as a Coronation gift to the British Royal Family. Upon arrival in England after being shipped on the Warrimoo from New Zealand, it was melted down to be made into a tea service for use in Buckingham Palace. This nugget was found in shallow ground on the banks of a creek near Ross township by the miners Sharp and Scott, who were working old alluvium which had previously been turned over during the first rush to these diggings in the early sixties. Other sizable nuggets were found, and in Blockade Gully a nugget of 10 and a half ounces was picked up. A nugget of 108 ounces was rumored to have come from the Lyell District during the 1800's. However its existence was never officially confirmed. It was said to have been taken to Australia where it would have been melted down … if it indeed even existed at all. Diggers first arrived on the Lyell Goldfield in 1862 after being led there by a Maori who knew of the existence of coarse gold in Lyell Creek. Eparara, a Maori prospector, and four other miners, discovered a 'dumbbell' shaped nugget weighing 19 and a half ounces prior to the arrival of significant numbers of European miners who recognized Lyell as a potential gold mining area. Eparara and his team fossicked for gold in a tunnel through solid rock, one mile upstream from where the road bridge is today. This discovery resulted in the desertion of other gold mines, and the establishment of the town known as Lyell. About 100 European diggers worked alluvial in Lyell Creek during 1863 and the creek soon became renowned for coarse, nugget gold. Nuggets weighing 17 ounces, 30 ounces, and even 52 ounces, were found in the early years of mining on the Lyell. In Irishman’s Creek, a tributary of Lyell Creek, a nugget weighing 21 ounces was found, and 500 ounces of coarse gold were mined in 5 days by a group of 5 miners. Not far from the Lyell, in Flaxbush Creek, at a point where the creek joins the Buller River, spectacular finds of nuggety gold were made in the 1800's. And in only two hours one miner obtained 28 ounces of coarse gold. Also, a nugget of 51 ounces, and another of 40 ounces, was found in Flaxbush Creek. In the late 1800's the West Coast was the largest alluvial mining field in the colony. It was all more or less auriferous, and, taking the number of miners employed and the value of gold obtained by them, their earnings compared favorably with the earnings of those employed in any other industry in the colony. During one year in the late 1800's there were about 74,617 ounces of gold obtained from the alluvial workings, representing a value of £301,523. Of all the West Coast rivers that produced nuggety gold, the Waimangaroa river north of Westport was known in particular for the significant number of nuggets found while mining. In the West Coasts Little Grey River during the 1860s some of the best examples of nuggety gold seen on the West Coast at that time, was reported as being found. After three months of mining, one party of miners bought 3,000 ounces of heavy nuggety gold into Greymouth to sell. Fifty of the nuggets weighed over 2 ounces; one weighed 12 ounces, with the remaining gold varying from 6 to 8 ounces each. In Murray Creek near Reefton, parts of the creek were extremely rich with several large nuggets found, including one nugget of 30 ounces. In one patch, 1,000 ounces of nugget gold were struck, with the largest piece weighing 23 ounces. And in Carton Creek, near Devils Creek not far from Reefton, a lone miner recovered 50 ounces of nuggets ranging in size from 20 ounces to half an ounce. Many large nuggets were found in the late 1800's and early 1900's from Moonlight Creek, in the southern portion of the Paparoa Range. In 1866 nuggets weighing 78 ounces and 79 ounces were found. In 1905 a 68 ounce nugget was found along with several smaller ones. And early in 1917 a nugget, called the 'Victory Nugget’ which weighed just over 87 ounces, was found, worth £350, that was purchased from the individual miner by the Bank of New South Wales. In 1869 a 70 ounce nugget was found by a party of miners on new ground in Mitchells claim about 2.75 km along the Moonlight track from Andersons Flat. The Argus newspaper stated in 1866 that "the Grey River district is becoming famous for its heavy nuggets. Some parcels of heavy gold, all in pieces varying from 9 ozs to 2 dwts in weight, have recently been brought down from Moonlight Gully, and out of one claim two nuggets weighing respectively 11 ounces and 17 ounces have been taken. The 44 ounce nugget is now in the possession of the Bank of New Zealand, having been purchased by it from the finder. The nugget is about the size and shape of a man's fist, and the gold is of a deep rich color. The small portions of quartz with which it is impregnated are also of a rose tint. The other nugget has not yet reached town". In the 1895 report, THE GOLDFIELDS OF NEW ZEALAND: REPORT ON ROADS, WATER-RACES, MINING MACHINERY, AND OTHER WORKS IN CONNECTION WITH MINING, it stated the following ... "The Moonlight Diggings are situated about seven miles up the Moonlight Creek from the Grey River. Some of the men now working in this field have been steadily at work on it since it was opened. The gold here is principally of a coarse, nuggety character, with very little fine gold. Some of the miners showed me the gold they were getting, and, in mentioning the prospects they were getting in their claims, referred to every piece of gold they obtained as a speck, whether it was large or small. They work sometimes a considerable time without getting the color of gold, and a few nugget pieces reward them for the time they have been working. There is very little wash-drift in the creek-bed in some of the claims, the nuggets being under big boulders, which they turn over with crowbars. From the information supplied me by the miners, this is one of the best fields for mining in the Grey Valley. The men are doing better here than in any other place in the Grey district. The workings are not confined to the creek alone. Some of the terraces and hills are worked from adit levels, while hydraulic sluicing is carried on in some parts". During the year 1930 a 12 ounce nugget was found in Deep Creek in the Wakamarina Valley. Nuggets weighing up to 25 ounces were found in localities such as the Slate River and Rocky River in the Collingwood District, Blackball Creek (22 ounces) and at Kumara. An unconfirmed report in the 1800s stated that a gold nugget weighing 110 ounces had been found at the Howard Goldfield, in the Murchison district. In 1868 a seven-ounce nugget was found in the Rocky River diggings, in Nelson Province, by a Maori who had, on the morning of the find, bought the claim for an ounce of gold. These diggings were noted for its rough gold and several large nuggets were found. Claims on this Goldfield were usually worked by small parties of men and returns frequently averaged £20 per man per week, with 3 ounce and 4 ounce nuggets being commonly unearthed. One of the largest was found by a digger named Gibson, and was valued at £50. In 1868, the discovery was made that the higher river-terraces were also very rich in gold, especially the one known as Maori Terrace. This proved highly payable, nuggets up to 6 ounces or 8 ounces being frequently found, and in one instance a party of two men while striping the surface uncovered a 19 ounce nugget. In Appo's Flat, in the same Goldfield as the Rocky River, nuggets up to 2 and 3 ounces were obtained. In Otago, one of the largest nuggets found in the early gold rush days was one of 27 ounces in weight, reputed to have been found at Waipori, in 1863, by Davies, one of the prospectors of that district. In the Otago Daily Times of November 6th, 1862, there is an account of a nugget weighing 12 and a half ounces, found by George Skeen in Nuggety Gully--described as being "three miles east of Waitahuna". In 1863 a purchase for the Provincial Government was made of a lump of solid gold, weighing nearly 15 ounces, found at Bungtown, on the short track from Lawrence to Waipori. Another, weighing 13 and a half ounces, was found in the Arrow River in 1864, and was also bought for the Provincial Government. Both these nuggets were solid and unmixed with quartz, and were very much rounded by the action of water. Other nuggets of from 8 to 12 ounces have been from time to time reported from the Otago Goldfields. A specimen, which may almost be called a nugget, was secured for £60 by the Provincial Government. It was composed of gold and quartz, the metal predominating. The gold was beautifully bright, and the quartz was milky white. It came from the Eight mile Creek--a branch of the Arrow, and it had been broken into three pieces before it came into the possession of the Government. During 1887, a nugget, referred to at the time as a monster nugget, was exhibited in the Bank of New Zealand, Queenstown. It weighed 78 ounces and was valued at £292, and was discovered by an Otago miner in one of the branches of the Shotover river. It was one of the largest nuggets found in all of New Zealand up until that time. The Wakatipu Goldfield in Otago Province was noted for large gold, generally smooth and of a bright yellow color, and some of the finest New Zealand nuggets were found there. The gullies near Dunstan, and in the Carrick Ranges and the valley of the Nevis, produced heavy, shotty gold. In Meredith's Gully, near the Obelisk, some exceedingly beautiful specimens of gold were obtained at an altitude of nearly 3,000 feet above the level of the sea! The gold of Fraser's diggings, near Powder Hill Creek, differed from other Otago gold by being large, rough, and of a reddish hue. Generally the coarsest gold was found near the heads of gullies, and gradually became finer as the lower end was approached. The remote Baton Valley Goldfield, at the base of Mount Arthur, was named after a runaway sailor who was helping the settler, J.P. Salisbury, make a track in the Motueka Valley, when they found traces of gold about 1855. Gold digging was in full swing by 1859, with about 100 diggers settled in the valley. There were some good discoveries of chunky gold, with the largest nugget found weighing 36 ounces. The nugget was spotted in a wheelbarrow filled with earth from a digging. In Southland Province the largest gold nugget credibly reported to have been found there weighed 36 ounces. It was found on the eastern flanks of the Longwood Range at Specimen Creek in the Printz-Arethusa area (now privately owned farmland). A number of alluvial nuggets over 10 ounces in weight were found in the same general area, along with some very good quality gold specimens (one called the Pankhurst specimen). A Mr Potter saw the Arethusa battery working in the area at the time of mining and noted the battery was crushing surface specimens with visible gold. Another Goldfield in Southland Province noted for nugget gold was the Preservation Inlet Goldfield. Numerous small nuggets were found with one nugget weighting over 9 ounces. On Coal Island alluvial gold was first found on the Islands beaches ... which was described by the miners as water-worn and rough and salty in character. On Crawfish Island rich specimen pieces of stone and gold intermixed came from an outcrop of quartz above the high-water mark on the north side of the island. Rich alluvial gold associated with quartz was found on McKenzie's Beach in the vicinity of outcrops of a main reef and leader. A nugget of 16 ounces was picked up on Moonlight Beach and was the largest size reported from this goldfield. In modern times a nugget of a little less than 10 ounces (9.7 ounces) in weight was found with a VLF metal detector at a depth of 15cm in the Paparoa Range in 1987. A professional dredger produced a 4 ounce nugget during a 180 ounce season in the 1980's, and in the mid 1990's a nugget (called “The Goldie”) of just over 4 ounces in weight was dredged from the Arrow River just a few kilometers downstream from Arrow Junction by a professional dredger. Both recreational and professional miners dredged numerous quarter and 1 ounce nugget's from the Arrow River during the 1980's and 1990's. And in recent years there were credible reports of a nugget of 8 ounces taken from the Arrow River catchment. 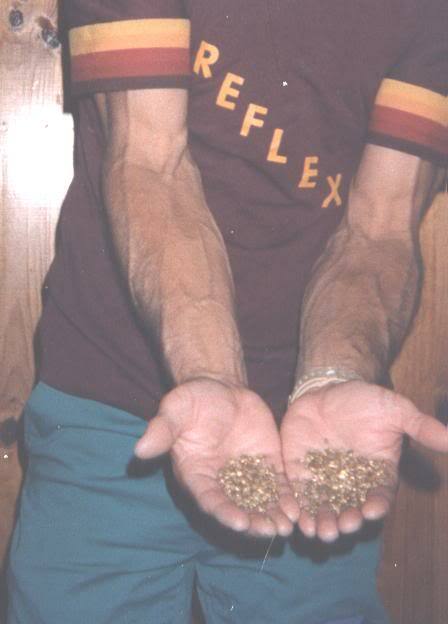 Some of just over 10 ounces of alluvial gold sniped from Otagos Arrow river, not far upstream from Macetown, in the early 1990s by a visiting American miner.